Take a walk down the H Street NE corridor and you’ll see towering residential complexes along the 600 block, a brand new Whole Foods grocery store, and construction teams digging out for an eight-story, mixed development complex. Several new restaurants, bars, and retail options – for dogs and humans – have also popped up along the streets. And with the DC Streetcar celebrating a year of service, the corridor has blossomed into a hub of life. That brings more than 725 units in the works in addition to the more than 1,450 units built since 2016. They include one-, two-, and three-bedroom apartments, condos, townhouses, and an artist studio. Though most of these projects offer neither underground parking nor residential permit allowances, they will draw new car traffic to the growing area. H Street’s development has taken years to plan, from permit requirements and traffic impact assessments to zoning adjustments, said Ward 6 Councilmember Charles Allen. The city created a commercial zoning overlay for the corridor and strategized ways to support the revitalization with housing, arts and entertainment, businesses, and more. The District has worked to prepare for the increased traffic with the streetcar and connection to Union Station, but traffic may bring more congestion to the area if visitors choose not to use public transport. “I don’t think you’ve ever completely prepared for all of the traffic and transportation needs,” Allen said. The District Department of Transportation (DDOT) coordinates with the Office of Planning (OP) and the Metropolitan Police Department (MPD) to prepare for large changes like the development of H Street, said DDOT spokesperson Michelle Phipps-Evans. DDOT assesses the impact to the overall transportation network; identifies access points to the site and public space; makes recommendations to the Board of Zoning Adjustment (BZA) and Zoning Commission; and makes cross-reviews with other planned projects in the District. “DDOT has reviewed all the development projects that went through the zoning process to identify the cumulative impacts to the corridor and identify mitigations needed through our Comprehensive Transportation Review (CTR) process,” Phipps-Evans said. This fits any major project, like the Apollo at 600 H St. NE and Avec set for 801-957 H St. NE. H Street has reached a new level of life with the businesses, restaurants, and residents moving in along the corridor, said H Street Main Street Executive Director Anwar Saleem. “In order for businesses to survive and do well down here, you need those people,” he said. But neighbors around the corridor worry that with more residents, the traffic and parking issues will only compound, said Advisory Neighborhood Commissioner (ANC) Chris Miller (6C05). “It will be incumbent upon DDOT to ensure that neighborhood thoroughfares are designed, maintained, and operated in a manner that protects pedestrians and maintains the flow of vehicles in a safe and consistent manner,” he said. ANCs 6C and 6A (covering the east and west sides of the corridor) have worked hard on parking and ensuring that residents in new multi-unit complexes don’t qualify for residential parking permits, Miller said. He noted that parking and DDOT’s imperceptibly slow review of proposed parking regulations will remain an underlying concern and fight. The Apollo (600 H St. NE) with 430 units and 70,000 square feet of retail. Insight Property Group finished the building in 2016. Anthology (625 H St. NE) with 307 units and retail. Jair Lynch Development Partners and Donohoe Construction finished it in 2016. Pullman Place (911 Second St. NE) with 42 condo units, which Fortis Development and Northridge Capital finished in early 2017. 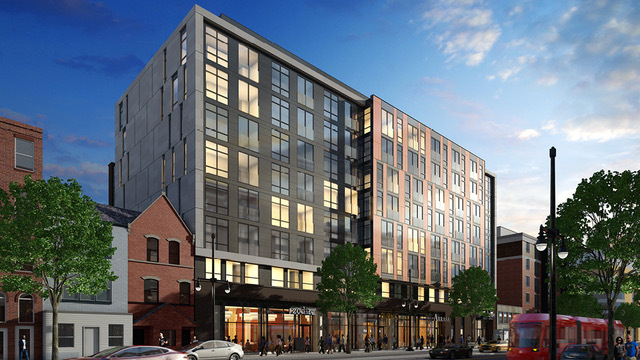 MRP Realty’s project at 315 H St. NE with 112 units, 6,000 square feet of restaurant space, and rising 90 feet tall. It is set to finish in 2018. Douglas Development’s project at 501 H St. NE with 28 apartments and three levels of retail space. 7|H (646-654 H St. NE) with 23 condo units and 15,000 square feet of retail restaurant or office space. Rock Creek Property Group and Cornerstone Development Group set the finish date in 2018. Avec (801-957 H St. NE) with eight stories, 419 apartment units, and 44,300 square feet of retail. Rappaport Companies and W.C. Smith set the finish date in late 2018. District Development’s project at 920-922 H St. NE with restaurant and live-act space and nine residential units. Monarch Urban’s project at 1111 H St. NE with six luxury apartments and 1,500 square feet of retail, set to finish in 2018. A 35-unit, 6,000-square-foot project at 1300 H St. NE. H Street Community Development Corporation, Insight Property Group, and Rise Development project the finish for 2018. Encore Condominium (1301 H St. NE) with nine condos and 5,000 square feet of retail from developer S2. An apartment complex with retail totaling 8,000 square feet at 1338 and 1336 H St. NE for the summer of 2018. Nine residential units with one artist studio added on top of the restaurant at 1341 H St. NE. Linden Court (1313-1323 Linden Court NE) with four, three-story townhouses from developer Monarch Urban. A 28-unit condo building and restaurant at 1401 Florida Ave. NE from developer Mehari Sequar. A sampling of new restaurants includes the Haymaker Bar (1015 H St. NE), Maketto (1351 H St. NE), Ten 01 (1001 H St. NE), and Sospeso (1344 H St. NE).